The Democratic Party (Turkish: Demokrat Parti), abbreviated to DP, is a centre-right, conservative Turkish political party, established by Süleyman Demirel in 1983 as the True Path Party (Turkish: Doğru Yol Partisi or DYP). It succeeded the historical Democratic Party and the Justice Party, two parties with similar ideologies. There have been four DYP governments since its foundation; one led by Demirel, the other three by Turkey's first and only female prime minister, Tansu Çiller. The party now has only 4 seats in the Grand National Assembly after faring poorly in recent elections, when many voters defected to the Justice and Development Party (AKP). On 5 May 2007, it was announced that DYP and the Motherland Party (ANAP) would merge to form the Democratic Party (Demokrat Parti). For that occasion, DYP renamed itself (based on the historical Democratic Party), and it was planned that ANAP would join the newly founded DP. Shortly before the election, however, the merging attempt failed. However, ANAP stated it would not contest the upcoming elections. After the DP only got about 6% of the votes in the 2007 general election, Ağar resigned as party leader. DYP and the Motherland Party eventually merged in November 2009. The DYP was seen as a centre-right, Kemalist-conservative party. It has on occasion been compared to the AKP in terms of similar conservative structures, although each party comes from considerably different backgrounds. DYP's history spans back to the historical conservative Democratic Party, established in 1946 with the introduction of a multi-party system in Turkish politics, whereas the AKP broke off as the more moderate wing of the disbanded Virtue Party. 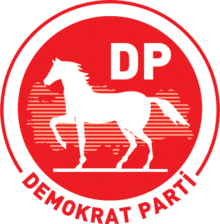 The modern DP's logo, a horse upon a red background, derives from the popular mispronunciation of its name, Demokrat Partisi. The word Demokrat did not readily roll off the tongue of rural voters, who found it easier to say Demir Kırat ("iron white horse"). After the renaming in mid-2007, the logo became a white horse on a red map of Turkey in order to evoke this mondegreen. The DYP's predecessor was the Democrat Party (Turkish: Demokrat Parti, DP), which was a conservative party responsible for relaxing Turkey's strict secularism laws. The party was suppressed in the 1960 military coup d'état and later reestablished as the Justice Party (Adalet Partisi, AP), which was disbanded in the coup of 1980. Both parties staunchly rivaled the social democratic Republican People's Party (CHP). The military overthrew their governments on several occasions: In 1960, the Adnan Menderes government was deposed and Menderes himself was executed; on March 26, 1971, the government of party veteran Suleyman Demirel was threatened with military intervention and forced to resign; and on September 12, 1980 the military carried out a full-scale coup, suppressing all political parties, including Demirel's AP. In 1983, Demirel created the Right Path Party (Turkish: Doğru Yol Partisi, DYP), the antecedent of the AP – still conservative, but now with a secular policy instead of an Islamist one. Even so, the military and conservative governments banned the new party, and the DYP was declared illegal and its members persecuted. Finally, in 1987, the party was legalized, and entered Turkish politics for the first time. It was hugely successful. In the 1991 general elections, the DYP defeated the Motherland Party (Turkish: Anavatan Partisi, ANAP) and the Social Democratic Populist Party (SHP), forming a coalition government with the SHP. Suleyman Demirel became prime minister once again. After Demirel was elected Turkey's 9th President, following the death of Turgut Özal, the party leadership was taken over by Tansu Çiller, who became the country's first woman prime minister. In 1995 the coalition with the SHP, now merged with the Republican People's Party (CHP), collapsed. After the December 1995 elections, the weakened DYP formed first a coalition with ANAP, led by Mesut Yılmaz. Then, in June 1996, the DYP switched allegiances to form Turkey's first Islamist government with the Welfare Party's leader Necmettin Erbakan. In 1997, with the "silent coup", the military effected the RP-DYP government's resignation. In the meantime, the DYP had been weakened by the effects of the Susurluk scandal. DYP and others expected to form a government under Çiller, but President Süleyman Demirel asked ANAP leader Mesut Yılmaz to form the new government instead, and the DYP was not included. In 1998 the DYP took a turn for the worse. The DYP then had heavy recruitment among police intelligence. The DYP secured 9.55% of the vote in the November 2002 general election, slightly under the 10% election threshold to enter parliament. However, a number of independents later joined the party, and, in November 2004, they had 4 seats in Turkey's 549-seat parliament. The figure hardly made the DYP a driving force in Turkish politics, but it remained Turkey's third largest party and particularly influential in rural areas. Tansu Çiller resigned as party leader following the 2002 election defeat, eventually being replaced by Mehmet Ağar. Map illustrating the party's performance at the 2007 general election by constituency. On 5 May 2007 it was announced that DYP and the Motherland Party (ANAP) would merge to form the Democratic Party (Turkish: Demokrat Parti). For that occasion, DYP renamed itself (based on the previous party of the same name), and it was planned that ANAP would join the newly founded DP. Shortly before the election, however, the merging attempt failed. However, ANAP stated it would not contest the upcoming elections. 1 2 "DYP-ANAP Ayrıldı" (in Turkish). Retrieved 2007-07-11. ↑ Kaplan, Sam (2006). The Pedagogical State. Stanford University Press. p. 172. ISBN 0-8047-5433-0. ↑ Akpinar, Hakan (1999-02-03). "DYP'de istihbaratçı savaşı". Hürriyet (in Turkish). Retrieved 2009-01-04. ↑ "Demokrat Parti'nin 10. Olağan Büyük Kongresi Yapıldı-Namık Kemal Zeybek, DP Genel Başkanlığı'na seçildi" (in Turkish). Demokrat Parti. Retrieved 2011-01-18.